We had the great pleasure of getting to meet Lora Ayers last year at Thursday Therapy. 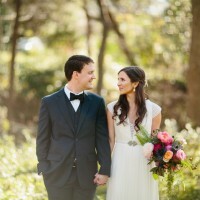 Lora recently moved to Dallas from Georgia and has brought her business with her – Lora Ayers Photography. Every time we see Lora she is so full of energy and can brighten any room up in a flash! We asked Lora a couple of questions about herself, her business, and some things that inspire her. We hope that you adore her as much as we do! How did you get started in the Photography business, and specifically with weddings? I started out doing child and family portraiture. Then someone that works with my mom had a daughter who was getting married and they asked if I would do the wedding pictures. I was very hesitant at first, but they were very persistent and if I didn’t do it then they were going to get a non-professional relative to do it, so I agreed. After that I started receiving referrals from other friends so I did a few weddings and just fell more and more in love with wedding photography each time. What is your typical day like as a Wedding Photographer on the day of the wedding, and also on a non-wedding day? Wedding days are so exciting! We show up 2-3 hours before the wedding ceremony begins. This allows us to start at the beginning of the story of your day. We get pictures of the bride getting her make-up done, her hair being perfected, the shoes, and the dress, then her putting on her dress, etc. Then we do the same with the groom and his friends. Whether the bride and groom pictures are before or after the ceremony it is by far one of my favorite times of the day. The ceremony and reception is when we focus on capturing all the emotional moments, some that we know are coming (like the first kiss, or the father daughter dance), and some that just happen. On a non-wedding day I wake up early to get the oldest kids off to school, and on certain days take my preschooler to school as well. I focus on the business and all that that entails until they get home. Then we have fun, laugh, and try not to take life too seriously. We cook dinner together, and make “homemade” cookies (you know the kind you pull apart and bake), and we have lots of dance parties. What would you say makes your style or personality unique from other Photographers? I love people, and I love weddings! I know everyone says this, but I’m truly passionate about what I do. I give it everything I’ve got every time. I’m one of those people that can mesh with all sorts of folks. I’ve always been told that I have a warm personality, and that I make people feel at ease. I hope that is true, and it is definitely what I’m striving for. As far as my style of photography goes I would say that I’m unique because not only am I trying to take pictures that are modern, fun, and creative, but I’m always trying to tell a story. One of my favorite pictures is a dad dancing with his daughter on her wedding day. His face tells a story. You can feel how much he loves her when you look at it, and I look for those moments at every wedding. What are some of your favorite images from your portfolio? I love laughter. My favorite images are usually when the bride and groom are laughing and enjoying their day with their friends, or emotional moments. I go crazy over detail shots as well! Whether it’s the brides shoes, or a unique piece of jewelry…there can never be too many detail shots. Here are some of our favorite pictures that Lora has taken! Favorite tips or advice for the bride and grooms to be? Obviously a bride looks at the photographers work, but I would challenge all brides to meet with their photographer and see how you feel around them. This is someone who will be following you around on one of the most important days of your life. Make sure that you like your photographer’s personality, and that you feel comfortable around them. I would add how important an engagement session is. An engagement session is good for both the photographer and the client. It gives you a chance to work together, and get to know each other more before the wedding. When you aren’t working, what are some of your favorite things to do? Go on dates with my husband Aaron, dance with my kids all over the house, shopping, meet with new friends over lunch, talk to old friends from Georgia on the phone, watch ridiculous reality shows, listen to Pandora, and let’s not forget spending too much time on facebook and blogs. Fabulous photography. Last shot was superb. Excellent work. Bride looks so beautiful. Thanks for sharing.